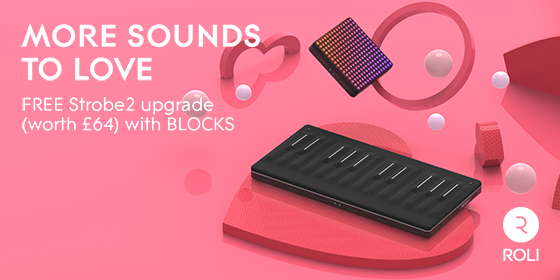 ROLI and UK distributor Sound Technology Ltd are pleased to announce a new Valentine’s week promotion for new ROLI BLOCKS owners. From Tuesday 12th February until Tuesday 19th February, all customers who have purchased a new BLOCK and registered it at my.roli.com within this period, will be able to redeem a free upgrade to the full version of Strobe2 software (worth £64). Step 1 Purchase a Lightpad Block M, Seaboard Block, Beatmaker Kit or Songmaker. Kit between 12th February and 19th February 2019. Step 2 Visit my.roli.com to create or log in to your user account and register your newly purchased Block between 12th February and 26th February 2019. Step 3 From your my.roli.com account redeem and make note of your Strobe2 serial number on your my.roli account. Login or create and activate an FXpansion account here. Once logged in, click “Register a product” on the account overview page. After registering, you can download Strobe2 from the “Product Downloads” page. Click on "View all available downloads" and follow the instructions to download each and install.